This mountaintop escape is nestled along a waterfall on Mill’s Creek in Lake Toxaway near Highlands, North Carolina. 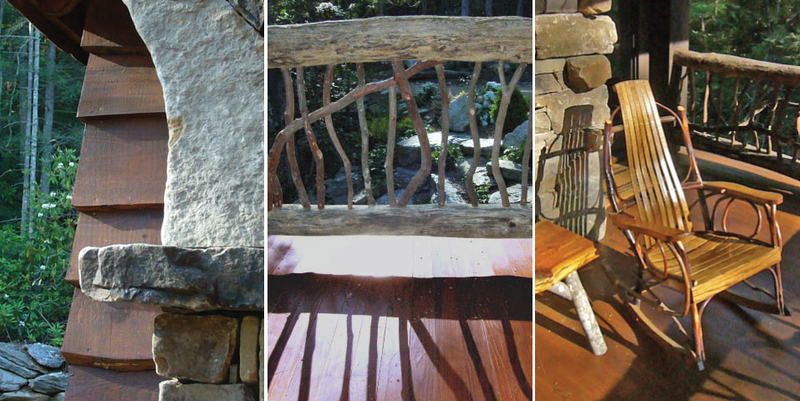 Our custom design contextually integrated the local, mountain vernacular architecture with the home’s idyllic, natural setting. We wanted to create a sustainable retreat evoking its native surroundings. We used local, natural building materials like in situ fieldstone, and we harvested white pines on the property to create the wavy, lap-board siding. Branches of the region’s beloved mountain laurels form the porch balusters and gable end details. Rough-sawn timber posts and brackets support the outdoor living spaces. Natural daylight fills the double-height great room through a wall of soaring windows. Lush natural landscaping, including azalea, laurel and rhododendron, surrounds this charming rustic lodge, which blends seamlessly into its setting. ©2014 D.T. Hubbell Architects llc. all rights reserved.